Cenotes are as cool as they are hair-raising. These mysterious sinkholes, which open up to subterranean water sources, are often tourist attractions, but they also draw in historians and archaeologists. Ancient Mayans may have used cenotes for human sacrifices, and some cenotes still have the bodies to prove it. On top of their creepy past, cenotes offer mazelike dark diving opportunities. Unfortunately, it's all too easy for people to disappear in their depths. What are cenotes? Why do people die in them? Why were they used as burial grounds by ancient civilizations? Some of these questions have answers, but experts are still trying to figure out the last one. They're not sure why there are so many bodies at the bottoms of these creepy natural wonders, but their presence appears both deliberate and ritualistic. 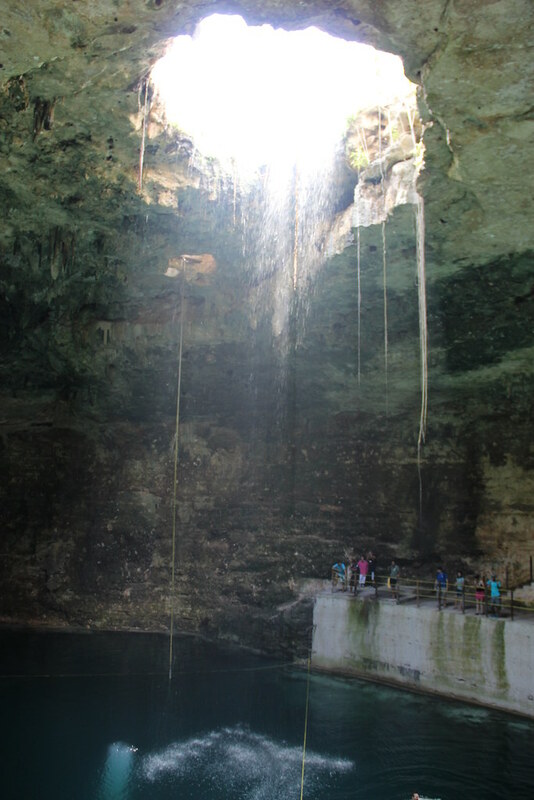 A cenote is a naturally occurring phenomenon that happens when limestone bedrock collapses into a cavernous sinkhole, which then fills with water. This process creates a sort of underground lake that's usually accessible by going straight down into the hole from above. The water is typically fresh, filtered by the earth and stone, which leaves the visibility near perfect. Where there's light, you can sometimes see all the way to the bottom without trouble. Cenotes resemble lakes, but they're much closer cousins to rivers. Cenotes connect to each other via winding tunnels and gaps in the rock, creating a never-ending flow of water. This flow may be so slight that you don't even feel it, but this is part of what keeps the water so bright and fresh. The twisting tunnels and clear water attract many divers. You can use guidelines to traverse some of them, and with scuba gear, you can swim down very deep and travel between different basins. But be warned - with the darkness, cramped passages, and mazelike interior, it can be easy to lose your way. Given how unique and beautiful these spots are, it makes sense that ancient people considered them holy. These were places where fresh water could be drawn and never seemed to run out. Mayans used to throw pots, clothes, jewelry, sculptures, and precious stones into cenotes, perhaps to thank them for their continued source of nourishment or to pray for further favor. Mexico's cenotes were supposedly major pilgrimage points for ancient people. 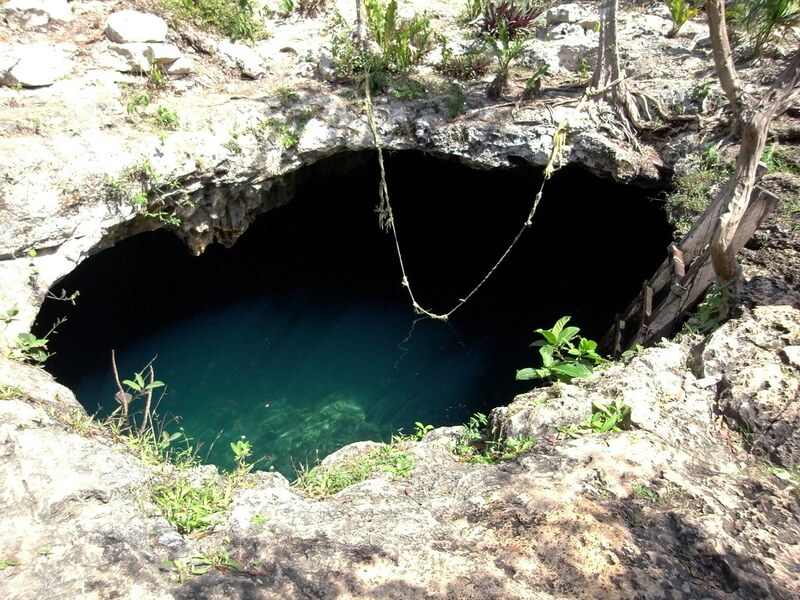 Many of them resided in the Yucatan area, where there are at least 6,000 cenotes. Some are near Mayan cities, and experts believe these cities were purposely built near the cenotes for spiritual purposes. As archaeologists explored cenotes, they found startling things. Some looked like they were converted into temples and showed signs of live animal offerings - or human sacrifice. In 2010 archaeologist Guillermo de Anda was exploring a cenote named Holtun when he came across something frightening. On a natural rock shelf, he found a human skull, as well as a two-edged knife. Everything appeared to be placed deliberately, suggesting the head belonged to someone killed in a ritual sacrifice. 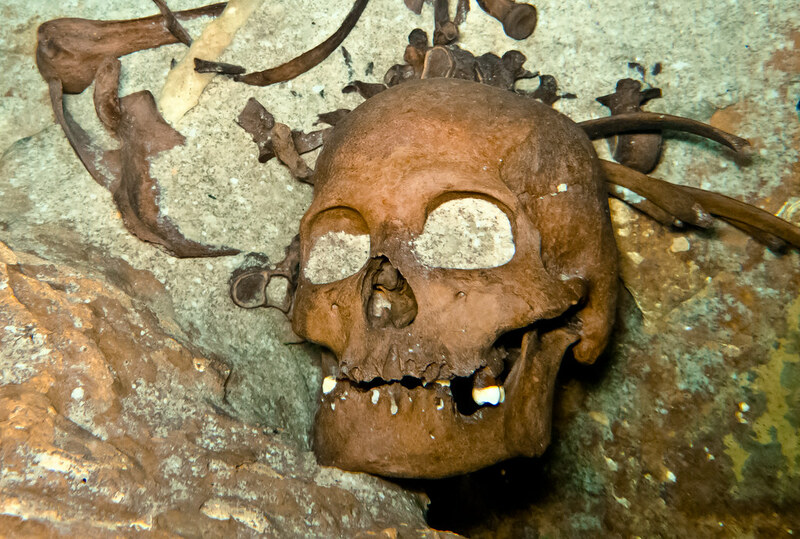 Some skeletons may also be signs people tried to explore the cenotes and failed. One cenote near the ancient Mayan city of Mayapan offered up an entire cavern floor littered with human remains. Divers discovered at least 15 skulls there, but it's hard to say if all were from human sacrifice. It may have been a place where plague victims were thrown after death, which is why the Mayans regarded this particular cenote with trepidation.